Anne Frank (1929–1945) was a German Jewish child, famous for writing a diary during the Second World War when her family were in hiding from the Nazis. Although her story ends in tragedy, Anne’s diary left a lasting legacy and has captivated generations of readers around the world. 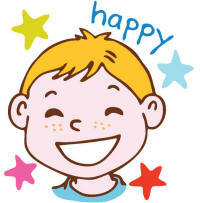 Learn more about this outgoing and expressive child, and enjoy our printable resources with the children. Today, Anne Frank House is a popular tourist attraction in the Netherlands, with more than a million visitors each year. The museum contains the Frank family’s hiding place, as well as an exhibition about Anne’s life. According to Anne’s journal, her sister Margot also kept a diary, but it has never been found. Anne Frank was born in Frankfurt, Germany, in 1929, to Jewish parents Otto and Edith Frank. Anne was an outgoing child like Otto, while her older sister Margot was shy like Edith. 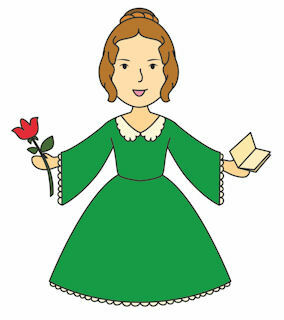 Anne enjoyed reading as a child and dreamed of becoming a writer. But the family’s life changed dramatically in 1933 when Adolf Hitler came to power. Hitler blamed Jewish people for his country’s woes. Realising it would be safer to leave Germany, the family moved to the Netherlands. The Franks began to settle in Amsterdam but when World War Two broke out, their life changed again. Germany invaded the Netherlands in 1940, and demanded all Jewish people register themselves as Jews. They were not allowed to work, so Otto gave his business to non-Jewish friends. On Anne’s thirteenth birthday, her parents gave her a journal – and this is how we know about her life. Things began to get worse for the Jews. They had to wear yellow stars on their clothes, and some were taken to concentration camps. Then in July 1942, Margot was ordered to attend a German labour camp. Otto was already planning to take his family into hiding, but decided to make the move the next day. They had to leave Anne’s beloved cat Moortje behind. The Franks wore all their clothes in layers so they didn’t look suspicious with suitcases as they travelled to their new home, an annexe above Otto’s business. The entrance was hidden behind a moveable bookcase. There were two bedrooms, a bathroom, a small kitchen and an attic space for storage. Just a week later, another family joined them – Mr and Mrs Van Pels and their 15-year-old son Peter (with whom Anne fell in love) – as well as a dentist called Fritz Pfeffer. Anne and her family were in hiding for just over two years – unable to see the sky or to walk outside. They kept very quiet during the day and covered the windows with thick curtains. Otto’s secretary, Miep Gies, and other office workers brought them food, clothes, books and news. Anne called her diary ‘Kitty’ after a friend. She wrote to ‘Kitty’ about her feelings; the books she read; her daily life; and the difficulties of eight people living in a small space. In 1944, with talk of Germany’s impending defeat, the family felt their ordeal was nearly over. But on 4 August, German soldiers stormed their hideout. An anonymous source had betrayed them. Everyone was captured and sent to concentration camps. The following year, Anne and Margot died at the Bergen-Belsen concentration camp in Germany, from a bacterial disease called Typhus. They were 15 and 19. Just a month later, the camp was liberated. Otto was the only family member to survive. He returned to Amsterdam, where Miep Gies gave him Anne’s diary, which he had published. Today, ‘Anne Frank: Diary of a Young Girl’ has been printed in over 60 languages. Anne’s life was cut tragically short, but Otto ensured she became the famous writer she always dreamed of. Anne's first entry into her diary on 8th July 1942 describes her feelings when she is told they are going into hiding, and what she decides to pack into her satchel. Jan and Miep Gies and their colleagues may not have looked like your typical "hero" but they certainly risked their lives in their heroic efforts to protect the Frank family and the others hidden in the Secret Annexe. This worksheet asks children to think about what makes a hero. The children can use this booklet to write down facts about Anne Frank, or perhaps they could write their own short diary? You'll need our origami booklet folding instructions found here. Here's a cartoon-style drawing of Anne Frank holding her famous diary - perfect for younger kids to colour in. Our factsheet is a great introduction to the short but important life of Anne Frank - perfect just to read, or to use alongside some of our Anne Frank activities. Our interview worksheets are a great way to bring famous people and historical characters to life, by asking the children to think of some questions for a talk show interview. Perhaps the children could use this newspaper writing prompt to write a report about the contents of Anne Frank's famous diary? This notebooking page is ideal for the kids to write down everything they've found out about Anne Frank and her diary. We have two pages, one fully lined and one with space for a picture. There are four photographic posters in this set. 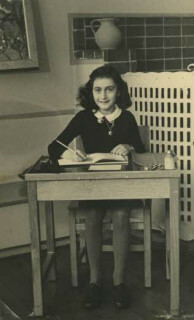 The first is a very well known image of Anne Frank, taken at school in 1940. It's available separately here if you prefer. Anne Frank is holding her famous diary on this poster. Print out and use for classroom displays and topic work. This well known photo of a young Anne Frank was taken at her school in 1940. She has such a lovely, cheeky smile on her face! Here's a worksheet featuring a lovely quote by Anne Frank, and the children simply need to write it in their own words and talk about what it means. Choose between lined or handwriting lined versions of our Anne Frank story paper, with a picture to colour and lines to write on. Use for creative writing or just copying a sentence or two. This story paper is perfect for older children writing about Anne Frank and features a poignant photo of her writing at a desk. The children can use it for their studies about her, or write their own diary entry perhaps? Anne Frank's life may have only been tragically short, but she was one of the most important people of the 20th century. Can the children fill in the important events in her life on this timeline worksheet? There are 18 hidden words in this Anne Frank word search. If you get stuck, we've included a separate solution too. Our fact-finding worksheets are designed to encourage your children to learn about new topics and people, and this one is all about Anne Frank. There are questions to answer and a picture to colour in. Anne Frank's diary has inspired many people who have read it over the years, and this Anne Frank writing page should inspire the kids to do some of their own writing. Anne Frank wrote one of the most famous diaries of all time. 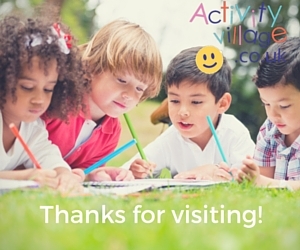 Can the children write a diary entry for a day of their own life on this worksheet, remembering to include the small everyday details? Anne Frank was one of the most important people of the 20th century and was a very strong and brave person. Can the children design a special medal to recognise her achievements? Jan and Miep Gies were friends of the Frank family and, together with Miep's colleagues Victor Kugler, Bep Voskuijl, and Johannes Kleiman, helped to hide them in the "Secret Annexe" of the Gies & Co offices during the Second World War, risking their own lives in the process. Follow our step by step, printable tutorial to learn how to draw your own picture of Anne Frank.